January 22, 2019 January 1, 2019 by Beau H.
The new year, as we’ve been discussing these past few weeks on The Style Guide, calls for continual reflection and, naturally, the best men’s style essentials you can get your hands on. Like the rugged denim shirt from Billy Reid that happens to be the focus of today’s #OOTD. Now, we’ve previously talked about how to wear a denim shirt for winter, so consider this a bit of a refresher in terms of casual style — this is the type of layered look that would even fly at the office on a casual winter Friday. The Billy Reid Denim Shirt in question is helped along by a stylish long-sleeve shirt from the good folks at Faherty Brand, plus slim chinos and, as ever, classic leather boots. Your outerwear (*ahem the Flint and Tinder Flannel-Lined Waxed Trucker) should also blend functionality and style for the winter — the prevailing thought behind this #OOTD is dependable style that works all week and all weekend. Pieces like a handsome leather watch from Martenero help cement the go-anywhere versatility of this look, too. Really, it’s all about finding new ways to wear pieces you already own — it’s a fun way to shake up your routine in the morning, and you might even find yourself trying some layering tricks you wouldn’t normally go for otherwise. So, with all that being said, it’s time to get down to business. Let me know what you think of this #OOTD over on Twitter. Thanks for reading! Dependable, functional layers make this #OOTD a winter winner (say that five times fast). The Denim Shirt: Billy Reid Denim Shirt, $195 — Richly crafted, rugged & made to break in over time, this classic denim shirt is an absolute beauty. Definitely a worthy inclusion on your list of winter style essentials. The Long-Sleeve Shirt: Faherty Brand Surf Stripe Crew, $88 — Dependable gear made from high-quality fabric is what you get from Faherty Brand. This soft, casually stylish long-sleeve tee is a perfect winter layer. The Jacket: Flint and Tinder Flannel-Lined Waxed Trucker, $220 — You’re going to need a dependable winter jacket, and this rugged waxed trucker jacket from Flint and Tinder is the one to wear. The Pants: Taylor Stitch Democratic Chinos in Organic Ash, $98 — Believe it or not, Taylor Stitch chinos have gotten even better, thanks to the use of organic fabric. These just might be the perfect slim chinos to upgrade your #OOTD. The Stylish Boots: Rhodes Dean Boots, $220 — Sleek, classic leather boots that can be dressed up or dressed down? 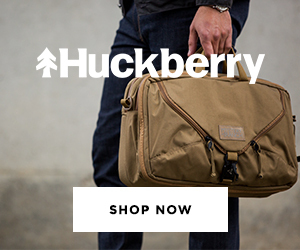 From Huckberry? Doesn’t get any better. The Watch: Martenero Ace Watch, $485 — This casual-yet-sharp watch is rugged & versatile — it looks to me like Martenero is now making your new favorite watch. The Stylish Socks: American Trench Edo Flower Socks, $29.50 — The good folks at American Trench just helped you upgrade your sock drawer. The Belt: Levi’s Icon Belt, $48 — Pleasingly rugged and well-made, Levi’s makes quite the stylish leather belt to complement this look. The Everyday Bag: Filson Ranger Backpack, $225 — There’s no question that Filson won’t let you down when it comes to a functional, stylish backpack. Now, hopefully, we’ve given you something to think about as you upgrade your wardrobe and refresh your style for 2019. When you start things off with a classic denim shirt, the potential really is limitless in terms of versatility. In this case, we’re layering that Billy Reid Denim Shirt with a stylish long-sleeve tee from Faherty Brand — just the right way to dress for a weekend stroll, a morning coffee date or a casual afternoon at home. Things are amped up just a bit with maybe, just maybe, the perfect slim chinos; that combo is perfect for work or play. Again, classic leather boots add sleek appeal and timeless style, as does a classic everyday watch from Martenero (quite possibly your new favorite watch, agreed?). No outfit would be complete without a tough winter jacket — enter a rugged waxed trucker jacket from Flint and Tinder, then get ready to field all kinds of complements about how great you look (seriously!). And as we always say, you can’t let your accessories fall by the wayside, hence the use of stylish socks from American Trench and a dependable leather belt from Levi’s. To round things out, go for the perfect blend of functionality and timeless style with a stylish backpack from the good folks at Filson. That’s really all there is to it. Well, not quite. But I’d encourage you to try some of these pieces on for size, then catch up with me on Instagram to see how I’m getting dressed this winter. December 15, 2018 December 5, 2018 by Beau H.
The best peacoat on the market? There’s certainly nothing else like it. Folks, there’s just no other way to look at it: The Billy Reid Bond Peacoat is an iconic jacket you need in your wardrobe this winter. Oh, and it’s worn by Mr. James Bond himself (as seen above). That’s it. That’s all there is to it. And if this classic peacoat wasn’t so well-made and uniquely stylish, that might be the end of this post. But trust me, there’s so much more to say about the exceptional Bond Peacoat from lauded American menswear designer Billy Reid. It’s great enough that it received prominent placement in the 2012 James Bond film “Skyfall” — of cours. The popularity of this coat (actually named for Bond Street in Manhattan) has only grown since then. Or is “legend” a more fitting word than “popularity”? At any rate, you can currently pick it up via the brand’s Web site, or via Huckberry — all the better, seeing as Huckberry is truly one of my favorite online shops for the stylish guy (that’s you!). That’s really just the start of what makes this coat so great. Now, we’ll be telling you all about how to wear this stylish peacoat in our #OOTD series in the coming days, but for now, let’s get down to business — the Bond Peacoat delivers in matters of style AND functionality, starting with the extremely warm double-woven melton wool construction. That alone makes it worth the *gulp* nearly-$700 price tag. It’s really not too often — try never — that you find a peacoat that so perfectly embodies style that’s suited for a secret agent and for the everyman, yet that’s just what the Billy Reid Bond Peacoat offers. Take the crisp navy color, as worn by naval servicemen decades ago. Heck, that color and this silhouette alone are enough to add class to any outfit. A slim, tailored peacoat that shot to prominence thanks to a certain secret agent. Add in small, seriously premium touches — including a leather-reinforced collar and horn buttons — and you’re looking at much more than your average peacoat. It’s also made in Italy, putting the Billy Reid Bond Peacoat a cut above the rest. Side slash hand warmer pockets and front flap pockets make this coat one that’s not just for show; use them to stow your everyday carry essentials on chilly winter days. It’s crisply cut, making it the ideal complement to tailored wool trousers and rugged leather boots. It’s also a nice way to stay warm in transit to the office or your holiday party — if I were you, I’d wear it over a classic chambray shirt and slim tan chinos, paired up with durable desert boots (read more about all those men’s style essentials elsewhere on the site). Again, you’re going to have to invest in the Billy Reid Bond Peacoat, but I can nearly guarantee it’ll be the last peacoat you buy. OK, that’s it. That’s the end of this post. Get out there and pick it up while you still can! October 20, 2018 October 2, 2018 by Beau H.
Take a chance on these corduroy pants — you won’t regret it. Getting great fall style from a classic brand like Billy Reid is sometimes, well, ridiculously easy. Take the subtly stylish, exceptionally well-crafted Billy Reid Corduroy 5-Pocket Pants, for starters. Cut like your favorite pair of jeans in a tailored silhouette, the Billy Reid Corduroy 5-Pocket Pants are nearly perfect for fall and winter — these aren’t your father’s corduroy pants, that much is true. No sir, these are an all-American pair of pants that works at the office or at the bar with plenty of men’s style essentials (like a crisp white Oxford and classic suede chukka boots, to start). Skeptical about corduroy trousers? Don’t be. The key here with the Billy Reid Corduroy 5-Pocket Pants comes with the classic construction and quality fit. The small-wale corduroy has a fine texture and what the brand calls a soft feel — your average pair of scratchy, stiff corduory pants, these are not. The Rubber color is also entirely unique and quite pleasing for fall and winter. The Billy Reid Corduroy 5-Pocket Pants will team up nicely with similarly rich men’s style essentials for fall, thanks to that cool color — it’ll look just great with a shawl collar cardigan and perhaps a classic chambray shirt, too (don’t forget your stylish brown leather boots). Small design touches separate these corduroy pants from the pack, too. We’re talking antique brass hardware and a neat embossed leather back patch, for starters. The bound waistband on the Billy Reid Corduroy 5-Pocket Pants provides some solid construction, too. In short: These are a pair of corduroy pants that won’t quit, and they won’t give out on you after a few wears. Pima cotton makes ’em special, too — you just don’t find many pairs of corduroy pants like that these days. And again, the fact that the Billy Reid Corduroy 5-Pocket Pants wear just like jeans makes them quite handy and useful when it comes to fall style. They’re even able to team up with a rugged henley and moc toe boots — throw on a rugged denim trucker jacket, and you’ve got a go-anywhere combo for just about anything you need to take on this fall. That’s all there is to it, in my mind. What say you? Will you be checking out the Billy Reid Corduroy 5-Pocket Pants? It’s hard not to love them, in my mind. October 6, 2018 September 19, 2018 by Beau H.
More than just your average sweatshirt, that’s for sure. We’ve all likely got that favorite weekend sweatshirt, the one that you reach for on cloudy, dreary, casual days — well, let’s shake things up a bit, because the Billy Reid Dover Sweatshirt is A) Your new seasonal favorite and B) One heck of an addition to your ever-growing list of men’s style essentials. Inshort, it’s got everything you need in a casual sweater, with an added punch in terms of style points, easy wearability and cool design details. Sounds pretty great, right? Billy Reid is one of those American menswear designers with a point of view that’s distinct and premium, yet uniquely accessible — case in point, the Dover Sweatshirt. Made in Canada from a cotton-poly blend in a classic crewneck sweatshirt design, this stylish weekend sweatshirt is a winner on all fronts … heck, it’s stylish enough to be worn to the office with slim five-pocket pants, suede Chelsea boots and a classic Oxford shirt for a nice mix of high and low styles. My personal favorite has to be the Natural color, but the Dover Sweatshirt is also available in a crisp Dark Midnight color. Really, it’s your call — you’re getting excellent versatility and style with the Billy Reid Dover Sweatshirt. The only question, really, is how to style it. Neat leather patches set this thing apart from the pack. Herringbone twill detailing and vintage-inspired leather elbow patches elevate the Dover Sweatshirt quite nicely. This is the type of sweatshirt that’s going to work with everything from perfectly faded jeans and suede chukka boots to slim corduroy pants and stylish brown leather brogues. When’s the last time you had a sweatshirt like that, ehh? The results are absolutely what you’d expect from a lauded designer like Billy Reid, who prides himself on doing things in a way that’s different yet accessible. Take the small finishing touches, like piping details at the armhole — the Dover Sweatshirt is made with craft and care top of mind. In short, you’re going to feel comfortable and look great, even if the only thing you can muster up is a visit to your local coffee shop. But preferably, you’re going to be dressed to take on the world (even on a weekend!) with the Dover Sweatshirt — it’s that stylish and sharp. For your Style Guide author, it’s the perfect grab-and-go piece to layer over a classic white T-shirt. But feel free to make the Dover Sweatshirt your own — it can certainly handle style scenarios aplenty.